We offer a variety of lessons from beginner to advanced levels. Our students are passionate about their riding and their horsemanship skills and strive to obtain higher goals. 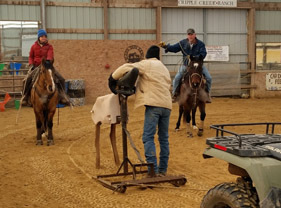 We offer lessons in horsemanship, equitation, barrels, poles, roping, cattle work, mounted shooting, ground work, trail/obstacle and ranch classes. The more you learn the more you realize there is to learn. 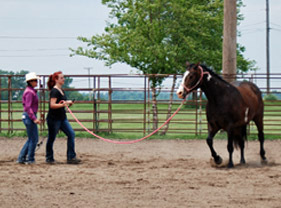 We provide a learning environment conducive to learning and use a variety of teaching techniques which build confidence in the horse and rider. We welcome students from Little Britches, High School Rodeo and ranch horse students as well as young riders looking to advance themselves in order to prepare to apply for an equine scholarship. 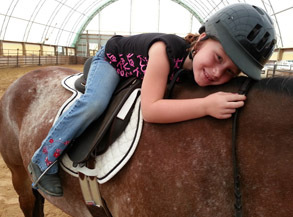 For the young riders we offer programs to learn to groom, tack, and handle a horse and ride. These programs are offered during the summer season as day camps. 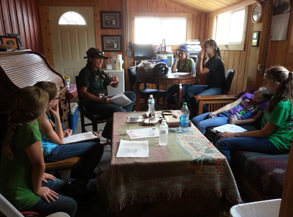 The day camp programs are for those students who want to learn more about the overall care and needs of horses, showing, and riding. 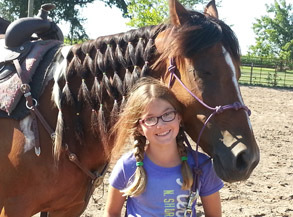 This is a program for the passionate horse crazy child who shows the interest and dedication to learn more. The child will be involved in many of the day to day activities including horse care, tacking, grooming, equine health care and RIDING! The camps activities change each session. We offer a 3 day and 4 day session. The cost for 3 day programs are $250 and 4 day programs are $295. 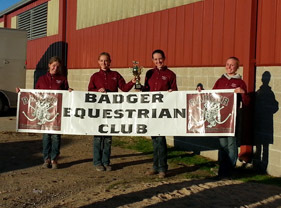 See the “clinics” page for details on dates and times for young rider events. Many of our young students have stayed with us for years and have grown up not just learning how to ride and care for a horse, but have learned valuable life skills in the process. These young students have gone on to college or careers with an upper hand due to their skills and confidence created within our nurturing environment. Many have received equine scholarships to help facilitate future learning and careers. 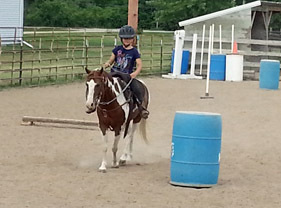 We offer private to semi private riding lessons. Our lesson style is personalized, detailed and friendly. Our instruction is from those who have ridden many years, competed and trained horses and riders of various levels. Our focus is on an equitation seat, legs and aides with an emphasis on soft hands, timing, rhythm and balance. We mostly ride Western with a bit of Dressage thrown into the mix. We love the blend of Western natural horsemanship and Classical Dressage theories and practices in our lesson program. 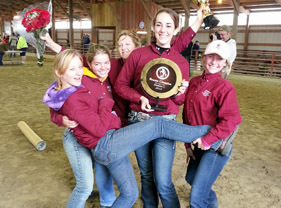 Many students want to progress in event specific areas such as Western Dressage, barrel racing, pole bending, working cow, roping, goat tying, and ranch versatility classes. We are competitive riders. We understand that it takes time to develop the skill sets needed to handle the top competition levels. Everyone has to start somewhere and with patience and persistence you can develop into a better rider and horseman. We will gladly assist you with lessons and coaching for events. Most students haul in their own mounts. We do have a limited number of lesson horses available. Youth Lesson: $30.00 45 minutes – covers haltering, grooming, tacking and riding. 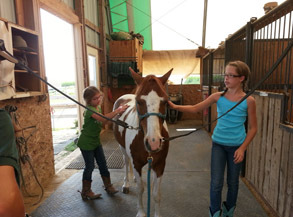 Youth Lesson Package Rate: $165.00 6 Lessons/45 minutes each – covers haltering, grooming, tacking and riding. Package must be used within two months of purchase date. Camp starts at 10 am and runs to 3 pm. Bring sack lunch and a labeled cup/mug. Snacks will be provided. Rates vary depending on the level of show and location. We offer the beginner rider a chance to start off on the right hoof. Instruction begins with haltering, leading, grooming, tacking, lunging, mounting, dismounting, safety stops, riding, unsaddling and putting a horse away. They learn how to take care of the equipment, care for their work area, and barn etiquette. The rider will be working towards a balanced seat with rhythm in the gaits. We add in some fun games and activities to the mix to help with hand/eye/body coordination. Rider will learn how to properly untack and take care of the equipment as well as turning out a horse. A balanced rider who can maintain rhythm at the walk, trot and canter is essential to all riding. Once this is established we continue on using patterns to help gain focus and body awareness. The leg, seat, body and hand aides become very apparent to the rider and harmony begins to come into play. We add in some specific events to help emphasize the learning. The rider will groom and tack their horse for the lesson and untack and cool out their mount. Riders seeking refinement with the equine partner and a soft feel are ready for advanced lessons. This is where the tiny details are important. We are looking for overall balance of the rider and horse. An advanced horseman is able to demonstrate a sense of softness in the cues, a balanced seat with intricate movements and good body/muscle coordination. Many times riders are looking to improve their riding, equitation or horse’s training and often have a directional goal in mind. We gear our lessons to best suit the horse/rider combination. The rider will groom and tack their horse for the lesson and untack and cool out their mount. 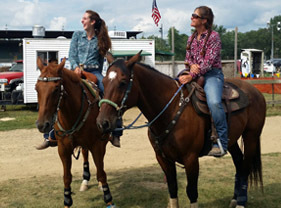 Those who would like an evaluation of their riding and horsemanship abilities would fall into the evaluation ride program. We look over the rider and how they are performing with their horse under saddle and on the ground. We will discuss the horse’s physical and mental wellbeing and care. We will provide feedback to the rider from an educated and knowledgeable trained eye. Let us help you explore where you are in your horsemanship/equitation skills and your horse’s training level. We will discuss the horse’s physical and mental wellbeing and care. This can assist the rider with great information as to what direction they want to go forth with and set future goals. Every rider and horse is unique and that partnership needs to flourish in order for the highest potential to be reached. With this in mind, we work together at setting individual pathways for each rider to achieve their dreams. $75.00 2 hours. We can often arrange transportation for your horse from our facility to the show grounds and assist you with getting ready for the show, knowing what you need for the show, the registration, and last minute tips of how to be the best you can be at the show. Rates vary depending on the length of show, location and type of show.